When we call William Hill a gem in online gaming, it is no marketing slogan. This company, indeed, is among the most comprehensive and professional betting sites in the world. In this review, we cover it in detail. At William Hill Casino, a full range of casino games is on the table. It matches the finest traditional casinos when it comes to the number of games offered as well as their quality. In fact, to compete with land-cased casinos, this site provides access to live dealers. There are other ways to bet, too. The players can use their accounts to make bets on sports, financials, bingo, and even buy online scratch cards. When it comes to support, it's available 24 hours a day, either online or via telephone. First of all, we start with the simplest and most popular ways to bet at casinos- the slots. It's not only that there are many slots at this place. What matters the most are their combined jackpots, currently standing at nearly £20 million! There are dozens of online slots. 5-reel, 9-reel, 8-paylines, 40-paylines, and so on. Some are based on traditional themes, some on Marvel comics, and others are video slots. This range caters to even the most demanding slot players. William Hill likes to add new games, so the offer always stays exciting. Some of the more recent slots include Land of Gold (based on an Irish theme), The Great Ming Empire (ancient China theme), or Who Wants To Be A Millionaire (based on a television show). Also, among the newer arrivals is Monty Python's Life of Brian, already with a progressive jackpot exceeding £200,000. Here, a winning spin can change a life. Still, there is an online slot with an even bigger jackpot. The Cat in Vegas has accumulated over £300,000. It's a 5-reel, 20-payline slot. Meanwhile, those players to like other payout combinations can choose Everybody's Jackpot that has 9 reels and 8 paylines. Now, it has a jackpot of over £220,000. Overall, there are 19 card games at William Hill Casino, including several versions of blackjack. Speaking of this classic casino game, the most interesting version is Progressive Blackjack. As there are Progressive Jackpots for slots, so there are progressive card games at this online casino. Currently, Progressive Blackjack has accumulated over £100,000. That looks quite encouraging to many online blackjack players. Yet another progressive game is baccarat. There are also other games to play such as Caribbean Stud Poker, Pai Gow Poker, 3 Card Brag, Red Dog, Pontoon, and Casino Hold'em. While this may sound impressive, there's an extra section specifically for online poker players in addition to this one. This one includes other poker games as well as tournaments, which have 5 million euros in prizes every month! William Hill has one of the finest selections of online roulette games. There are 16 different versions of this traditional game. European, American, French roulette versions are there, all in addition to many others such as Mini Roulette or 3D Roulette. Meanwhile, online Craps comes with two dice and multiple bet options. There's also Wild Viking, which is a roulette-style card game. On top of these, Live Casino allows for real-time betting on some other games- whether based on cards or tables. Another section of this site leads to online bingo. While there, there are multiple bingo plays taking place on a frequent basis, many with great prizes. Various types of this game can be played such as 75, 80, and 90 ball Bingo, or Multi-variant Bingo. So the players never get bored, William Hill has other games. There's Keno, online scratch cards, and many other games such as Heads or Tails, Penalty Shootout, Pinball Roulette, Darts, and many more. It is also possible to bet on politics, or play Lotto. 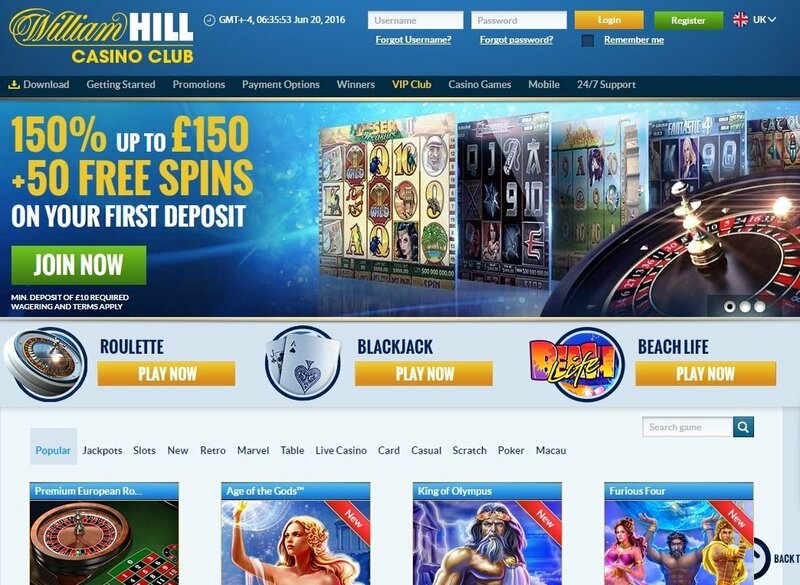 William Hill decided to expand the gaming offer to online sports betting. Many popular sports are covered. Some include American football, horse racing, athletics, handball, darts, baseball, motor racing, rugby, volleyball, and snooker. In-Play Betting is an great another feature. Financial betting at William Hill is pretty expanded with Fixed Odds and Binary Betting. Bets on various markets can be placed. These include major currency pairs, stock indices from around the world, and commodities (gold, silver, and oil). So this way, William Hill customers can take advantage of many worldwide opportunities. When it comes to William Hill Casino, there's up to £150 First Deposit Bonus, up to £200 Download Bonus, Second Bonus, and up to £3,500 Monthly Bonus. Some other promotions and rewards consist of Refer a Friend Bonus, Comp Points, Free Spins Bonus, and VIP Club. In addition, those who play poker, bet on sports, do financial betting, or play Bingo, qualify for specific bonuses. Overall, the bonus offer is wide. William Hill is operated by WHG (International). The company is licensed in Gibraltar by the Gambling Commission. Players can expect to deal with a fully professional betting company. William Hill is, indeed, a brand name. While some players may concentrate on just online or mobile slots, some others like poker tournaments. There are also those who like sports betting or like to day trade the financial markets. Some of these games have large progressive jackpots, or great odds, so the chances of winning big are there, although there are no guarantees. It is easy to access all these betting venues with a William Hill account. This way the customers can't complain about the lack of betting opportunities. If one compared William Hill to a large shopping mall for online gambling entertainment, it wouldn't be an exaggeration. The quality of the site is high and so is security. The ways to navigate are simple, while the games are technologically advanced. After all, one of the leaders in this industry wouldn't settle for second grade gaming software.